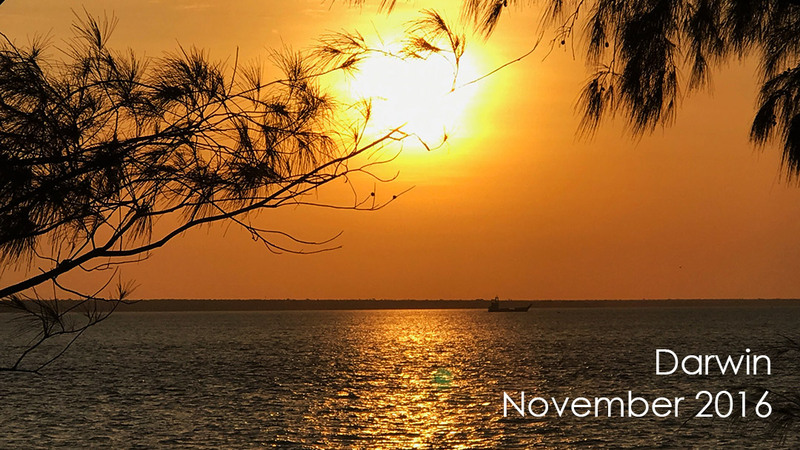 There is one word to describe our month house sitting in Darwin – HOT! We were there for the whole of November which is known as the ‘build up’, prior to the arrival of the wet season. We did have some ‘crackers’ of storms and most afternoons the humidity and heat would rise to breaking point. The first few days there we thought we were going to expire. Having come from Canberra where we sitting in front of a log fire, we felt as if we had landed IN a fire with the temperatures well over 35 degrees. After about a week we acclimatised and settled into a month of heat and exploration. We had previously visited Darwin in June 2016 and did a tour through Kakadu & Litchfield National Parks. 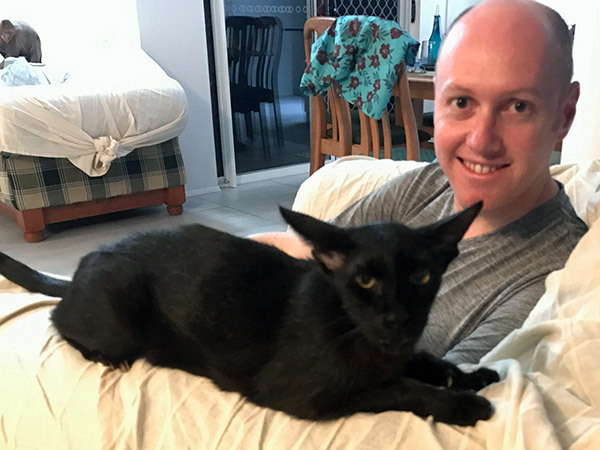 We were therefore keen to experience the city as a local so when offered the opportunity to care for Mambo, a 16 year old cat, in the East Point suburb of Fannie Bay, we jumped at the chance. Our house owners were going on a month long holiday in Europe. Their two story townhouse was recently renovated and had a unique indoor/outdoor bathroom. The downstairs was not air conditioned but upstairs was, so we often retreated upstairs to cool down. 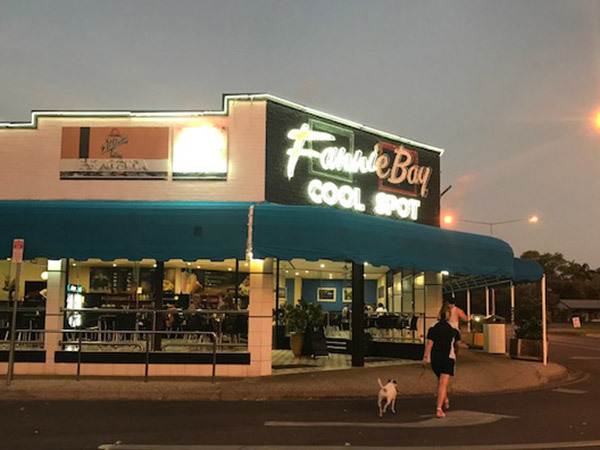 In fact, one of our favourite games whilst in Darwin was to find the place with the best air conditioning. We would often visit shopping centres or walk in and out of shops on the mall to get relief from the heat. We concluded that ‘Cotton On’ was the best air conditioning on the mall. We also became members of the Casino as it was fully air conditioned and had several restaurants and cafes which could easily fill in a couple of hours. We attended the inaugural Charles Darwin Film Festival which presented local film makers and their work. For $5 we could sit all day in the air conditioned comfort of the Entertainment Centre and be entertained by films that had to have been predominantly filmed in the Northern Territory. 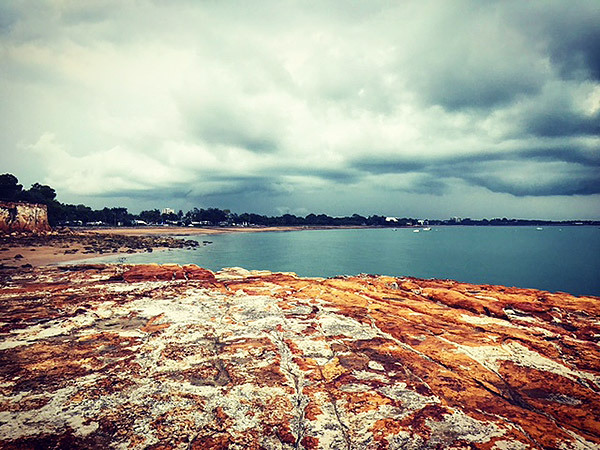 Darwin is a fascinating city, famous for significant historical events including Cyclone Tracey (1974) and its involvement in World War II. Even today, sites can be visited showing the devastation that the cyclone caused or emphasising how close war was to Australian soil, particularly with the bombing of Darwin. The Parliament House building, affectionately known as ‘The Wedding Cake’ has interesting artefacts on display, is fully air-conditioned and we took advantage of the free tour which explained the parliamentary system of one of only two territories in Australia (the other being Australian Capital Territory). 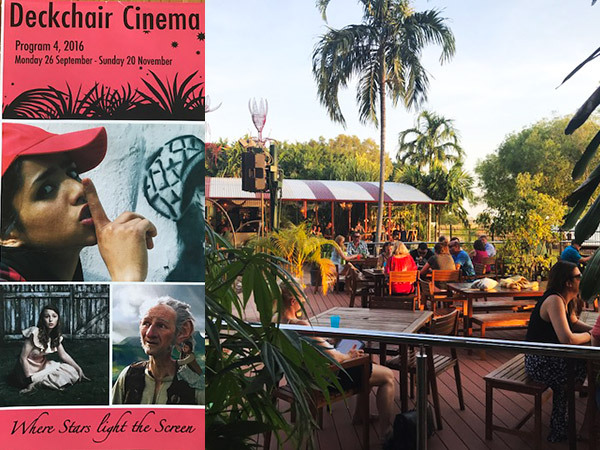 The Deckchair cinema is a must do when visiting Darwin. Each evening, films are projected on a large outdoor screen whilst you sit in deckchairs and enjoy the ambience. 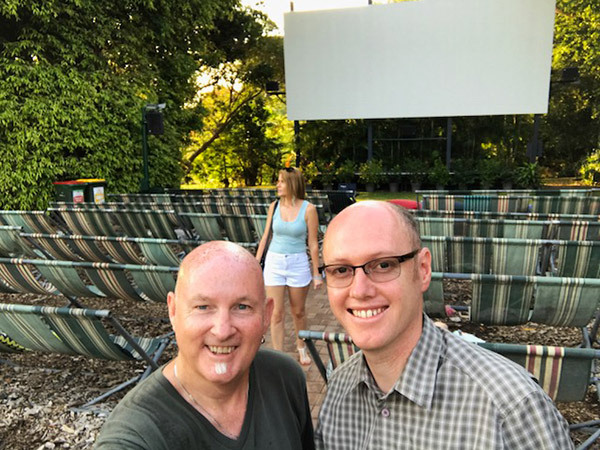 It really is a fun thing to do and we saw the appropriately titled, ’Last Cab to Darwin.’ Earlier in the evening we had assisted a fellow tourist to find the cinema. We found out later he was the ex-brother-in-law of Jacqui Weaver who was in the film. Amazing coincidence! One of the joys (and sometimes challenges) of house sitting is navigating the local transport system. We are quickly realising that such systems are designed by people very familiar with the local area and this often baffles tourists. As we had no car included in this sit, we had to persevere and learn the system, including navigating the timetable app. We encountered incorrectly numbered buses, out of date timetables displayed on stops, buses running very early or very late and weird routes that changed part way through the day. We became quite good at navigating the system by the end of the month and could plan our day accordingly to prevent having to stand too long in the heat waiting for a bus. After securing a house sit, we start investigating local events and activities and in particular we look up local theatres and yoga studios. 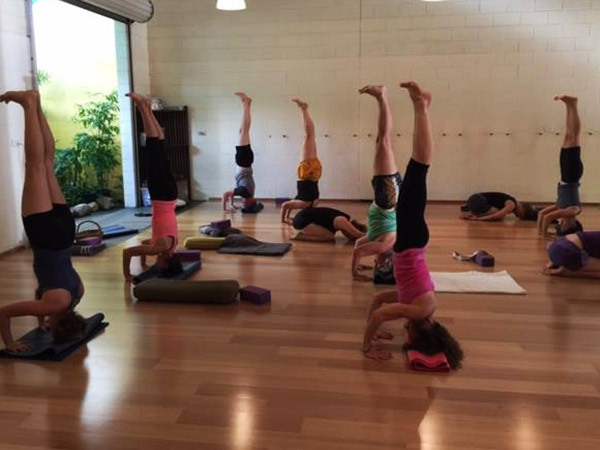 In Darwin we found Browns Mart Theatre and Darwin Yoga Space. 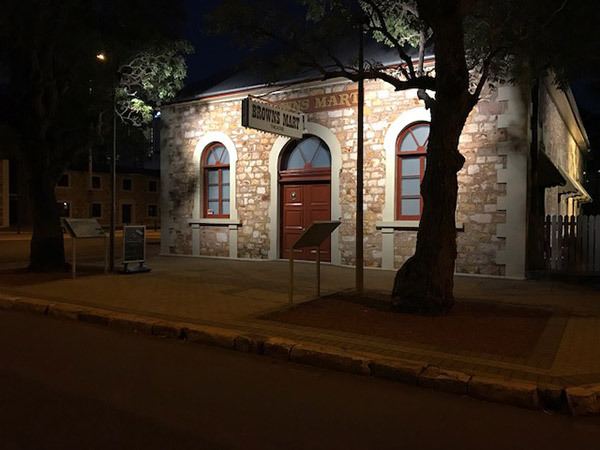 The theatre is located in Darwin’s CBD in a historically significant building dating back to 1885. We attended a performance of Closer by Patrick Marber – a modern drama that explores the concept of what may be true for one person may not necessarily be true for another. We had also planned to see a new play by local playwright Kate Wyvill, ‘And I’m the Queen of Sheba’ but tragically one of the actors, Russell Kiefel passed away the day prior to the season opening. Darwin Yoga Space almost became a second home to Andrew as out of the 32 days in Darwin, he sweated his way through 28 classes. It was a great intensive in a lovely studio (although not air-conditioned) just up the road from where we were staying. 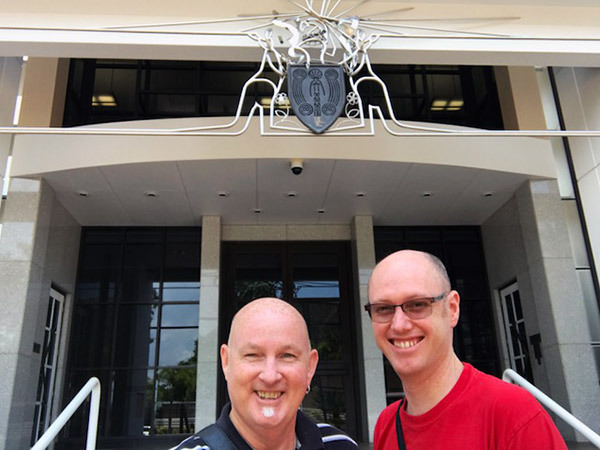 He made many connections with teachers who knew his original teacher(s) from Sydney and the heat certainly added a new dimension to his yoga practice. 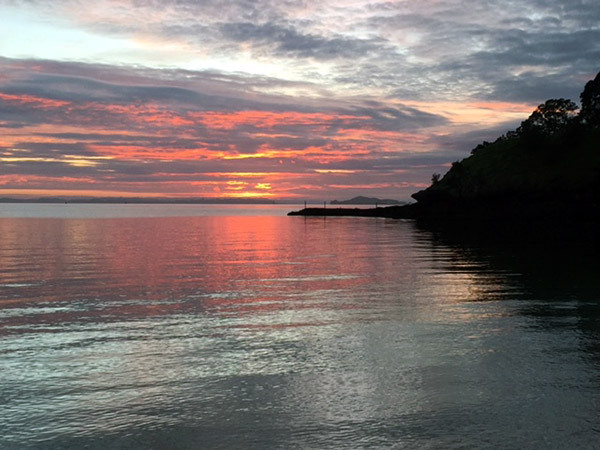 Read further about Andrew and his ‘Life as a Travelling Yogi’ here. Friends from Sydney describe Darwin as ‘The Last Frontier’ and this is evident in the newspaper headlines of the NT News. 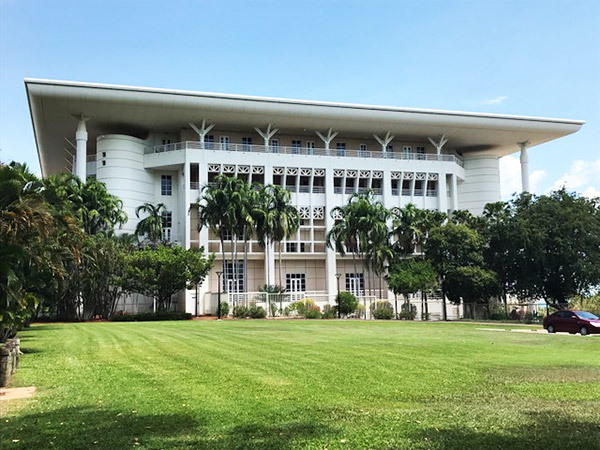 On our previous visit to Darwin we visited the local museum where they had an exhibition of front pages of the NT Times – a fascinating social history captured in image and text. The headlines sometimes reach far beyond the local community and often appear on Facebook and other social media if they are particularly shocking. The ‘NT’s favourite sl**’ headline referred to a chocolate dessert on the menu at Pee Wees Restaurant. Due to public backlash, it was renamed. 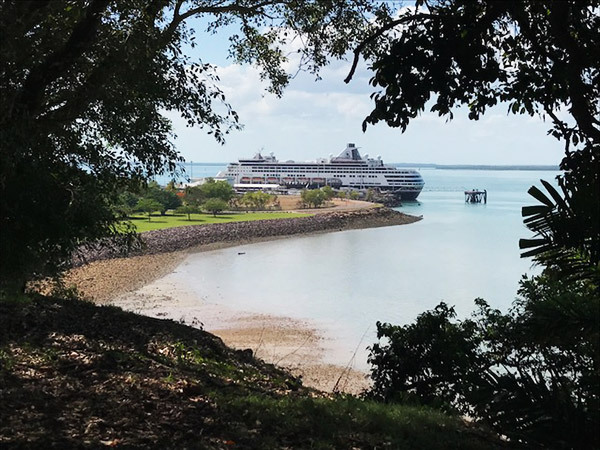 Darwin is becoming a cruise ship hot spot and we often encountered ‘cruisers’ who were spending the day in Darwin as part of their itinerary. But just like the cruise ships leaving port, after a month of glorious sunsets and very hot weather, we too departed Darwin, destined for Brisbane. Great story, I could almost feel the Darwin heat! We were once a pair of those “cruisers”, stepping off the ship for an intensely hot though enjoyable day.